Is believing in Christ just saying a few words? Is it some mysterious spiritual-sounding concept? Or is it a rock-solid foundation for your life now—and forever? Millions of people profess a belief in Jesus Christ, but is their belief consistent with the biblical description of believing in Jesus? Can your faith in Christ be a counterfeit version of the real thing? Or, on the other hand, do you think faith in Jesus Christ is a meaningless, sentimental platitude? Do you consider belief in Christ the territory of religious fanatics who are out of touch with the practical needs, issues and realities of everyday life? The true Jesus of Nazareth thundered this warning to those who did not believe: “You are from beneath; I am from above. You are of this world; I am not of this world. Therefore I said to you that you will die in your sins; for if you do not believe that I am He, you will die in your sins” (John 8:23-24). Surely the question of faith in Jesus Christ is no light matter reserved for only the religiously sentimental. Ignorance can cost you your eternal life. The question that becomes immediately relevant is this: What does it truly mean to believe in the real Jesus Christ of the Bible? As we will see, belief in Christ means believing and trusting Him and doing what He says. That He is God and divine, the same type of being as the Father, though willingly submissive to the Father’s authority. That He existed eternally with the Father, without beginning or end. That He walked this earth as a man—that Christ was a real, historical figure. That He continues to exist at the right hand of the Father. That He is a living example of the way of life that pleases God, and that the goal of true Christians is to grow into His likeness (Ephesians 4:11-16). Belief in Christ is built on the foundation of trust in the reliability of the Gospel accounts as a source of historical truth. Take the time to inquire about and test the origins and authenticity of those accounts. Jesus of Nazareth brought a message from God called the gospel, which means good news. The gospel reveals that Christ will return to the earth as a king, and like any other king, He will have a kingdom with subjects, territory and laws that He expects His subjects to obey. His message also contained a grave warning, as well as good news. Jesus of Nazareth brought a message from God called the gospel, which means good news. The gospel reveals that Christ will return to the earth as a king, and like any other king, He will have a kingdom with subjects, territory and laws that He expects His subjects to obey. His message also contained a grave warning. ... The warning is that we must repent; otherwise, we are in danger of annihilation for our sins against God. Sin is breaking His laws, summarized by the 10 Commandments. The good news is that there is a way out. God has offered us forgiveness through repentance of sins and belief in the gospel (see Mark 1:14-15). Faith in Christ means believing this message with its warning and good news, as well as the premises upon which that warning and good news are based. 1. He became a sacrifice—dying for us so that we can be acquitted of past sins. 2. He now provides us, through the gift of the Holy Spirit, with the power to stop breaking the law, along with access and intercession before God. 3. He has promised to transform us at His second coming into immortal spirit children of God. Faith in Him means accepting the terms and conditions by which we can be beneficiaries of God’s grace and of Christ’s saving work (the above three phases). 1. We must repent and stop breaking the law, since breaking the law is responsible for the penalty of eternal death hanging over our heads. 2. We must exercise the type of faith in Christ described throughout this article. 3. We must submit to the Father and Christ. 4. We must be baptized to express the above-described repentance and faith. Trust means to be confident about the reliability of a person’s words and performance in the face of risk. Jesus Christ is so trustworthy that we can have rock-solid faith in His promises and in His love for us. This can help us deal with all the dangers and risks we face. The stakes are high, but God’s faithfulness is unshakable. This confidence can help us avoid succumbing to the negative influences of Satan the devil, the evil world and our own human carnality. It can help us keep repenting, overcoming and striving for perfection until the end. Faith in Christ means trusting Him to bring you through successfully in the face of all the adverse possibilities. It includes going to your limit in doing all you can do, while depending upon Him to do all you cannot do. So faith in Jesus the Christ is not about fanciful sentimentalism reserved for a religious mind that is out of touch with everyday realism. On the contrary, it is about commonsense cooperation with a being who is genuinely interested in your eternal survival and in rescuing you from a collision course with certain future destruction. 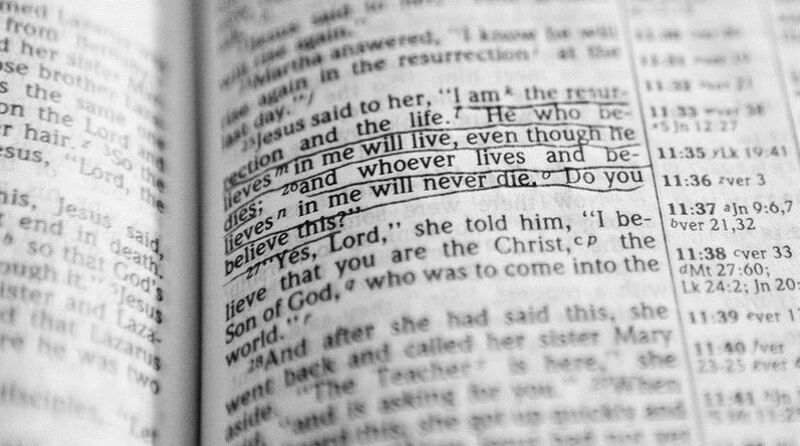 Jesus said, “You believe in God, believe also in Me” (John 14:1). Believing in Christ means believing in His existence, believing His gospel message, accepting Him as Savior and trusting Him as Lord and Master. Epistle of Straw—or a Book of Faith?